Our first meeting (in person or by Skype) is a no-obligation chat. What are your marriage ceremony ideas? 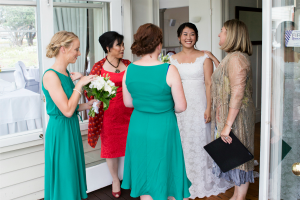 How do you envisage your “big day”? Is there a mood, style, or theme you prefer? Who and what is important to you? I guide you through the general structure of a marriage ceremony, answer any questions you have, and explain the legal requirements. I supply you with notes and questions to get your ideas flowing. No idea where to start? Don’t panic – it’s my job to listen, prompt, guide and recommend. You have booked me (yay!) 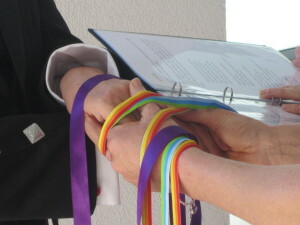 so we meet a second time to focus on specific ceremony details, especially the content of your vows and any readings, poems, blessings or symbolic rituals you have chosen. I have plenty of ideas and examples to share… and more questions to ask you! I don’t have a “template” wedding ceremony, so next, I take our discussion notes and turn the best bits into your ceremony. In essence, I write your love story to share out loud. I’ll email you the draft to check and change. There will be no surprises – you have complete control over the things I say on your big day. Things start to feel “real” when, a few days before the wedding, we meet to rehearse who and what goes where. 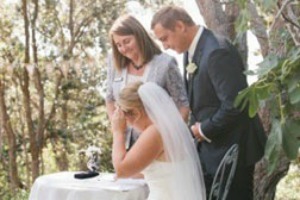 This is the time when the finest details of your ceremony are completed and last minute questions answered. It’s choreography, but it’s not a perfect stage play – so we will have fun practicing in a relaxed and friendly way. Ideally your parents, bridal party (guys and gals), MC, and reader(s) should attend the rehearsal. I arrive at least half an hour before the scheduled ceremony start time, and ensure everything pertaining to the ceremony is where it needs to be (yes, that includes the marriage papers, wedding rings, tissues and rescue remedy.) Take some deep breaths, relax, and enjoy your moment in the spotlight, as I make your marriage official. I leave shortly after the ceremony ends. It is my legal responsibility to file a copy of your Particulars of Marriage (which we sign during the ceremony) with the Registrar of Births Deaths and Marriages. 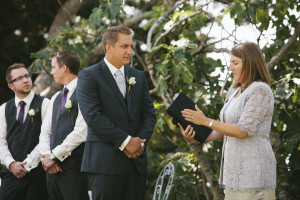 After your wedding, I email you a copy of your ceremony, including some photos, as a keepsake.